with a positive treatment of foreign workers and spouses, the chairman of the new government-funded Taiwan-Asia Exchange Foundation (TAEF, 台灣亞洲交流基金會) said Saturday. The think tank was expected to lead efforts to strengthen relationships with the countries targeted by the New Southbound Policy, 10 member nations of the Association of Southeast Asian Nations and six countries in South Asia as well as Australia and New Zealand. The policy was launched by President Tsai Ing-wen after she took office in May 2016. 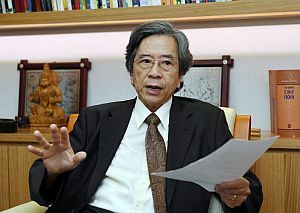 Charity starts at home, so people in Taiwan should begin by treating foreign workers and spouses well, TAEF Chairman Michael Hsiao (蕭新煌) said in an interview with the Central News Agency.